Poppy Lane has a lot on her plate. As a leader in the Society for the Suppression of Supernaturals (SOS), she has tried to keep her personal life separate from her secondary life. But when her husband, Winston, is attacked and horribly wounded by a werewolf, her secrets come out to the detriment of her marriage. Win doesn't trust her any more for fourteen years of lies. Poppy's hidden ability to freeze the world around her, literally, and her family's involvement in other supernatural facets have also put her in the crosshairs of another violent supernatural—one who is threatening something even more important to Poppy than she can even imagine. After the brutal attack, Winston Lane vows to face the future without Poppy as he struggles to recover from his wounds and deal with the scars both on his face and in his heart. But his deep love for his wife, and the dark secret he, too, has kept from Poppy all these years, make the separation from her impossible. The two find they must team up in order to stop Isley, the most evil Demon. Poppy and Win must enlist help from several SOS members as well as friends. These include Mary Chase, a GIM (Ghosts in the Machines) for her incredible tracking abilities, and Jack Talent, a shapeshifter. But none of them are prepared for the lengths Isley will go or the horrible secret he keeps. 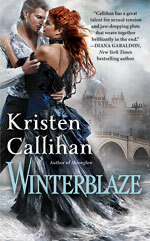 Page turner is an understatement in describing WINTERBLAZE. Readers will be hard pressed to put this book down once the opening scene unfolds. Poppy and Win struggle to deal with the wall their secrets have built between them, but are forced to put their heads and hearts together in order to defeat Isley, who Poppy believes is immortal. Secondary characters are vital in this exciting sequel to FIRELIGHT and MOONGLOW, especially Mary and Jack. Pay attention to little details too! Another Perfect 10 by Ms. Callihan, and I very highly recommend reading this entire series. Congrats to Momof1DD as the winner! AN AFFAIR TO DISMEMBER - Elise Sax - The Matchmaker Series, Book 1 - 2/2013 - Diana - New! THAT NIGHT ON THISTLE LANE - Carla Neggers - Swan River Valley, Book 2 - 2/2013 - Diana - New! THE SECOND CHANGE CAFE - Alison Kent - A Hope Springs Novel, Book 1 - 3/2013 - Patti - New! DEADLY STING - Jennifer Estep - Elemental Assassin Series, Book 8 - 3/2013 - Robin - New! GARDENS OF STONE - Sophie Littlefield - 3/2013 - Diana - New! - 20th Century Historical - New! QUEEN JEZEBEL - Jean Plaidy - A Catherine de Medici Novel - 3/2013- Jani - New! THE MISTRESS MEMOIRS - Jillian Hunter - The Boscastle Series, Book 10 - 3/2013 - Diana - New! TRAVIS - Georgina Gentry - The Texans, Book 4 - 2/2013- Diana - New! EDGE OF DAWN - Lara Adrian - A Midnight Breed Novel, Book 11- 3/2013 - Terrie - New! BEHIND PALACE DOORS - Jules Bennett - 3/2013 - Patti - HD #2219 - New! A REAL COWBOY - Sarah M.Anderson - 2/2013 - Diana - HD#2211 - New! THE THINGS SHE SAYS - Kat Cantrell - 3/2013- Patti HD #2218 - New! Chat Wed night with Madeline Hunter! New York Times Bestselling author Madeline Hunter joins us to discuss her book, THE CONQUEST OF LADY CASSANDRA. Door prize: One lucky winner will receive a signed copy of THE CONQUEST OF LADY CASSANDRA! Hope to see you there for a historically good time! If Sadie Turner is good at anything, it’s putting stuff in order. So when she finds her “perfect” life in disarray, she hopes a summer vacation at her aunt’s lake house will help her piece it back together. 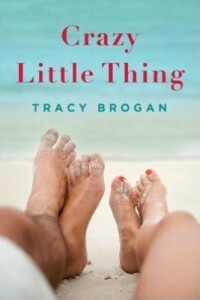 She wants to relax, reboot, and heal the wounds left by her cheating ex-husband. And that requires time away from men. Sounds like a good read! If you're interested, post a comment and you'll be entered to win a copy! Q & A with Poppy Dennison! Diagnosis Wolf (Creature Feature Anthology) is the story of Andrew Hughes, a nurse who is assigned a patient with a mysterious illness. When Caleb’s eyes begin to glow and he grows claws and fangs, Andrew wonders if he’s finally lost his marbles or if there’s more to Caleb’s illness than he knew to be possible. It’s very hard to come up with a believable illness for a werewolf! Typical tropes have them immune to most diseases and able to heal most injuries. I had fun trying to find a way to keep Caleb sick while making it work within the accepted lore. Diagnosis Wolf is my fourth published piece. I’ve been writing professionally for the past two years, but have been a storyteller from the time I learned to put pen to paper. 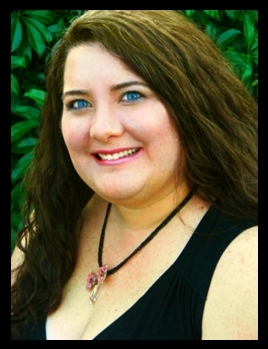 My co-author for the Creature Feature anthology, Mary Calmes, is a huge inspiration to me. Not only is she an amazing author, she’s an incredible woman as well. They’re thrilled, but don’t quite understand why they have to wait so long between stories! I love to be crafty—I sew, crochet, and paint at the moment. I’m trying to learn to cook a bit more and one of these days I’m going to master the art of knitting. Q & A with Christine DePetrillo! Chat tonight with Ellora's Cave authors! Q & A with Ellen L. Ekstrom! Q & A with Tawny Weber!!! Chat Wed Night with Elizabeth Hoyt! Q & A with Madelyn Porter! Chat Wed night with Margaret Mallory! Win a $10 Amazon or BN gift card!! !